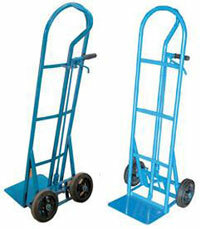 The Dual Directional Hand Truck Dolly works great as a standard two-wheel hand truck or as a panel cart. This unit allows the user to transport loads forward/backward or left/right. You can transport loads of crates or boxes, or by turning the 8" x 2" mold-on-rubber wheels, you can turn the hand truck into a panel cart. Moving down narrow aisles or doorways is no longer a problem with the adjustable wheels and easy steering. Steel construction. Painted finish. Specs: overall size 20"W x 18"D x 51"H; nose plate 14"W x 8"D; capacity 600lbs.